Jabez Wilson, a London pawnbroker, comes to consult Sherlock Holmes and Doctor Watson. 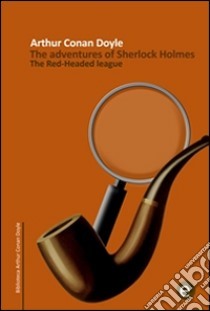 While studying his client, both Holmes and Watson notice his red hair, which has a distinct flame-like hue. Wilson tells them that some weeks before his young assistant, Vincent Spaulding, urged him to respond to a newspaper want-ad offering work to only red-headed male applicants. The next morning, Wilson had waited in a long line of fellow red-headed men, was interviewed and was the only applicant hired, because none of the other applicants qualified; their red hair was either too dark or too bright, and did not match Wilson's unique flame color. Wilson tells Holmes that his business has been struggling. Since his pawn shop did most of its business in the evenings, he was able to vacate his shop for short periods in the afternoon, receiving £4 a week for several weeks (equal to £380/week today); the work was obviously useless clerical work in a bare office, only performed for nominal compliance with a will, whereupon he was made to copy the Encyclopædia Britannica. Wilson learned much about the subjects starting with the "A" version and looked forward to getting into the "B" section. One morning, a sign on the locked office door inexplicably announced that "THE RED-HEADED LEAGUE IS DISSOLVED." Wilson went to the landlord, who said that he had never heard of Duncan Ross, the person who managed the league office. The landlord did remember the tenant with scarlet hair and gives him a card which directs Wilson to an artificial knee company. Wilson ends the story with how frustrated he is losing the £4 a week. Holmes and Watson laugh at Wilson because of the ridiculous situation, but Holmes assures him that by Monday they will solve the case. Wilson leaves after having given the detective a description of Spaulding; Holmes decides to go and see Spaulding, whom Holmes notices has dirty trouser knees. Holmes then taps on the pavement in front of the pawnbroker's shop. With the case solved, he calls Police Inspector Jones and Mr. Merryweather, a director of the bank located next door. The four hide themselves in the bank vault and confront the thieves when they show up. They are John Clay, who has a long history of criminal activity already, and his helper Archie. Under the alias of Spaulding and Ross, they had contrived the 'Red-Headed League' rigmarole to keep Wilson out of his shop while they dug in the basement, in order to break into the bank vault next door. Although paying Jabez Wilson four pounds a week was expensive, it was a pittance compared to the ill-gotten thousands they were looking to steal from the bank. Back at Baker Street, Holmes explains to Watson how he solved the case.